Learn more about this error from eBay and how to clear it. Some background on this error: Ebay allows only approved sellers to use strikethrough pricing or discount pricing. Brands also have standard prices for products where the product cannot drop below a certain price. This error from eBay is stating that for one of these reasons, you cannot discount this item. The easiest 'win' when you see this eBay error is to make sure that your eBay seller account is eligible to offer strikethrough pricing. Errors aside, strikethrough pricing is a great benefit to selling on eBay, allowing your listings to display encouraging discounts to customers. When you see a product with this eBay error in Zentail, another useful area to check is the Price and Availability tab of the product. After scrolling down to the bottom of this screen, you will see a checkbox for 'On Sale Indefinitely' as well as the ability to add strikethrough pricing. 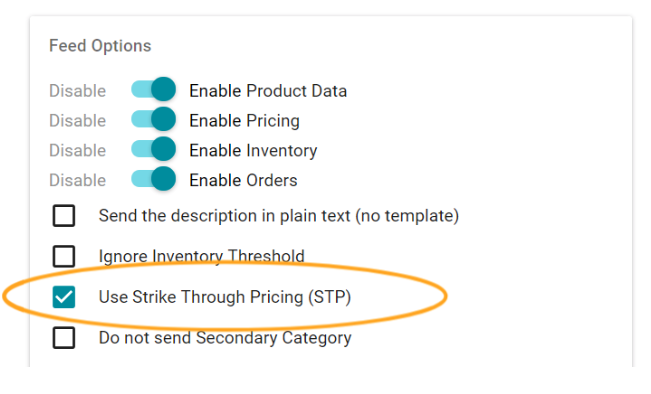 If strikethrough pricing is enabled on Zentail, yet your eBay account itself is not enabled for strikethrough pricing or sale pricing, this can cause the error. To fix this error, the strategies below will help. Make sure that your eBay seller account itself is enabled for strikethrough pricing. If your eBay seller account is enabled and approved for sale and strikethrough pricing, chances are good that you won't run into this error on a large scale. If your eBay seller account is not enabled or approved for strikethrough pricing, one option is to uncheck the 'on sale' pricing for the product Zentail. This will remove the sale from all marketplaces, including eBay. If you don't want to remove the sale for all marketplaces, check out Strategy 3 below. Utilize an eBay price override. A price override will allow you to set a price for the product just on eBay. No other marketplace prices will be affected. This will allow you to keep the 'on sale' checkbox in Zentail checked, and it will also allow other marketplaces, such as Walmart, to display the sale price. Learn more about price overrides and how to enable price overrides here. Let's say your eBay seller account is approved for strikethrough pricing, yet you still see this error. At this point, it is important to check the brand of the product that is being listed, and to make sure that the sale price is not dropping below the brand's established price for the product.